Meningioma is the most common type of primary brain tumor. Meningiomas grow slowly it may take years before they cause symptoms. Here are the most common symptoms of Meningioma. Meningioma is the type of brain tumors that grow from the layer of tissue that covers the spine and brain and may squeeze or compress nerves and vessels in the brain. According to Johns Hopkins Medicine, "Meningioma is the most common type of primary brain tumor, accounting for about 30 percent of all brain tumors." Around 85% of meningiomas are benign (not cancerous). 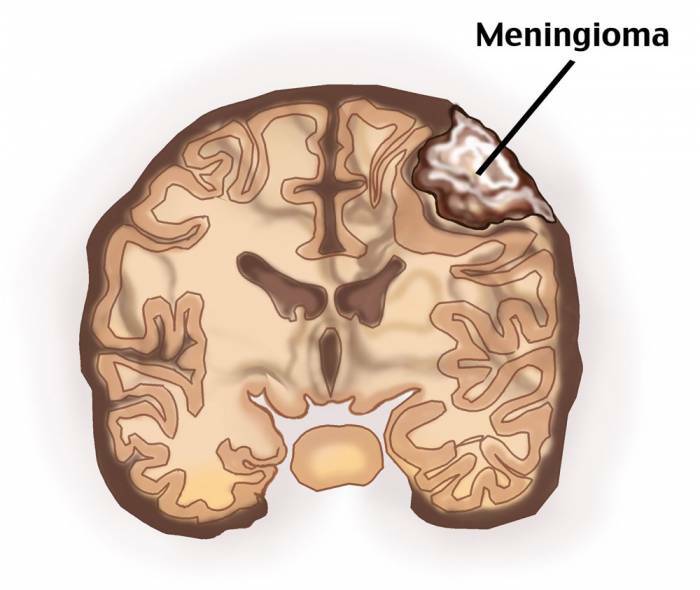 Meningiomas usually grow slowly cause no symptoms and require no immediate treatment. But in some instances, benign meningiomas can cause serious problems. According to a New York Times article, "The only known causes for meningiomas, usually benign, are rare inherited genetic syndromes and therapeutic doses of ionizing radiation to the head and neck." According to the Mayfield Clinic, "While malignant meningiomas occur in both women and men, benign meningiomas are three time[s] more common in women." According to Mayo Clinic, "[I]n some instances, their effects on adjacent brain tissue, nerves or vessels may cause serious disability." Seizures: Seizures are sudden involuntary movements of a person’s muscles, may cause a person to pass out, stiffen, or have jerking muscle movements. Meningioma Patient frequently suffers from seizures, prevention of seizures in patients with meningioma is an important goal, because tumor-related epilepsy significantly impacts patient quality of life. The most common symptoms of meningioma are headaches for weeks to months. As Meningioma grows, its increasing size can increase the pressure inside the skull which can cause frequent headaches, these headaches may worsen over time. If the tumor grows large enough, vision problems may occur. Meningioma compresses the optic nerve that connects the eyes to the brain, or the part of the brain that controls vision, which can cause vision changes or complete loss of vision. If a meningioma encroaches on the cerebellum, cranial nerves may become compressed can cause hearing loss or ringing in the ears. Meningioma grows along the nerves that run between the brain and the nose and often cause changes in your senses (eg, smelling a scent that is not really there). In addition, it can cause loss of sensation in the face or facial numbness. Meningiomas aren’t found unless your brain is scanned, MRI scans to help determine the size, location, and type of any tumor.